Assimilation wetlands are natural wetlands into which secondarily treated and disinfected effluent from a wastewater treatment plant is discharged to improve water quality and wetland sustainability. Nutrients in the municipal effluent increases wetland plant growth, and organic matter deposition on the wetland surface, which increases elevation and offsets subsidence and produces a positive feedback loop of increased ecosystem vigor and resiliency. Freshwater in the effluent provides a buffer against saltwater intrusion events, especially during drought. Thus, the introduction of treated municipal effluent into disturbed and isolated wetlands is a positive step towards their ecological restoration. This practice also benefits dischargers by reducing capital, operations, and maintenance costs compared to conventional wastewater treatment. The concept of using municipal effluent for restoration of wetlands in coastal Louisiana originated with Breaux and Day (1994), who proposed that adding nutrient-rich effluent to hydrologically isolated and subsiding wetlands could promote vertical accretion through increased organic matter production and deposition. Their work, and other studies, has shown that treated municipal effluent does stimulate productivity and accretion in wetlands (Hesse et al. 1998; Hunter et al. 2009a; Shaffer et al. 2015; Hunter et al. 2018). In addition, removal of nutrients and sediments from municipal effluent by assimilation wetlands has been well documented at the cities of Amelia (Day et al. 2006), Breaux Bridge (Blahnik & Day 2000; Hunter et al. 2009a,b; Hunter et al. 2018), Broussard (Hunter et al. 2018), Hammond (Shaffer et al. 2015; Hunter et al. 2018), Luling (Hunter et al. 2009b; Hunter et al. 2018), Mandeville (Brantley et al. 2008; Hunter et al. 2018), St. Bernard (Day et al. 1997), and Thibodaux (Zhang et al. 2000; Izdepski et al. 2009). Design and construction of an assimilation wetland typically requires a Louisiana Department of Natural Resources (LDNR) Coastal Use Permit (CUP), Louisiana Department of Environmental Quality (LDEQ) Louisiana Pollutant Discharge Elimination System (LPDES) permit, and US Army Corps of Engineers (USACE) 404 permit and Water Quality Standards certification, along with potential levee board permits, all of which Comite Resources has obtained for numerous projects. Comite Resources works with municipalities to assess wastewater treatment needs and to identify potential wetland areas that would benefit from effluent discharge. Comite Resources collaborates with project engineers to design the effluent distribution pipeline and with LDEQ, LDNR, and USACE to secure permits. 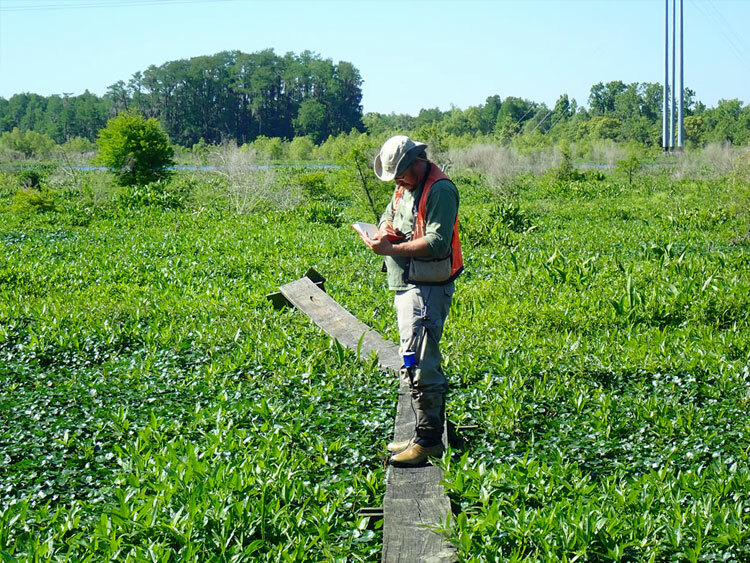 Comite Resources monitors assimilation wetlands serving the cities of Breaux Bridge, St. Martinville, Luling, Hammond and Mandeville and visits each wetland monthly to collect ecological data. 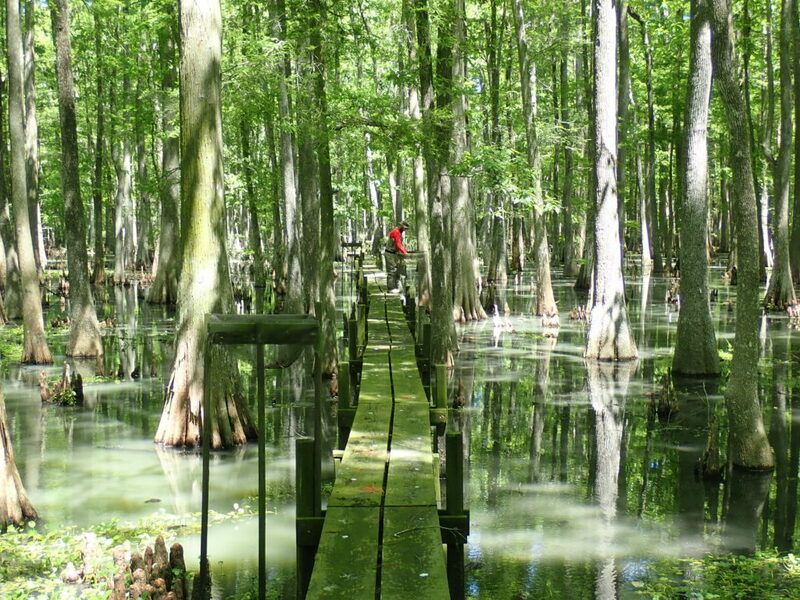 During the late 1940’s the city of Breaux Bridge began discharging secondarily treated and disinfected municipal effluent into the Cypriere Perdue swamp, a 1,470-ha freshwater forested cypress-tupelo wetland located approximately one mile southwest of Breaux Bridge. In the late 1980’s the city received a compliance order from the USEPA and eventually an LPDES permit was issued in 1997 with BOD5 and TSS limits of 30 and 90 mg/L, respectively. The permit requires the City to monitor plant species composition, productivity, and metals concentrations, surface water nutrient and metals concentrations, soil accretion and metals concentrations, and hydrology of the assimilation wetland. Comite Resources has been monitoring this wetland and assisting the City in meeting its LPDES permit requirements since 2001. The city of St. Martinville began discharging secondarily treated and disinfected municipal wastewater from the city’s 1.5 MGD treatment facility to the Cypress Island Coulee baldcypress- water tupelo swamp in 2011. The Cypress Island Coulee wetlands have been degraded by urbanization and conversion of surrounding areas to agriculture, and are characterized by over-drained soils and subsidence. Because these wetlands were used for rice and crawfish production, they consist of a number of shallow ponds separated by low levees. Treated effluent is discharged at six different locations around the south basin of the wetlands and surface water drains into the Cypress Island Coulee after flowing through the wetlands. Comite Resources handles all ecological monitoring required by the LPDES permit for the City. The city of Luling discharges secondarily treated and disinfected effluent into a 608-ha baldcypress-water tupelo swamp directly to the east of the wastewater treatment facility. The site is located within the Davis Crevasse, a large crevasse splay that was formed in the 19th century when the Mississippi River broke through the flood control levees and deposited sediments in an area of about 150 km2 (Day et al. 2016), forming the eastern boundary of the assimilation wetlands. Under natural conditions, water from the site where the oxidation pond is now located flowed in a southeasterly direction towards Lake Cataouatche. The dredging of Cousins Canal short-circuited surface water to flow directly to the lake, bypassing surrounding wetlands. The discharge of effluent from the treatment plant into these wetlands is a partial return to more normal water flow (Hunter et al. 2018). In 2014 Comite Resources measured carbon sinks and sources at the Luling assimilation wetlands and found the net difference between the Project (wetlands receiving effluent) and Baseline (no effluent) emissions was 11,617 mt CO2e/y (metric tons of CO2 equivalents per year; Lane et al. 2017). 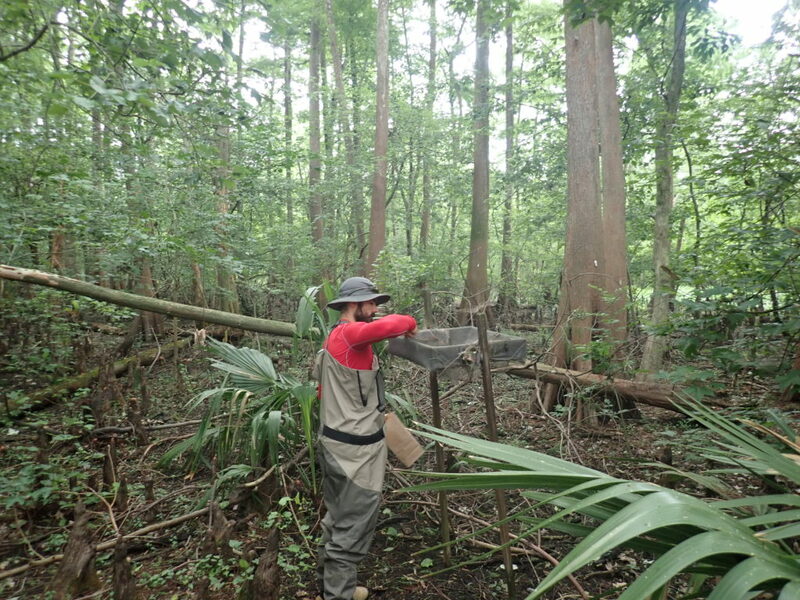 This study demonstrated the potential for using forested wetlands receiving treated municipal effluent for the net sequestration of carbon. Comite Resources has been actively monitoring the Luling assimilation wetlands to keep the City in compliance with its LPDES permit since 2005. During the fall of 2006, the city of Hammond began discharging secondarily treated and disinfected effluent into Four Mile Marsh located in the northwest corner of the Joyce wetlands (Lane et al. 2015b). The Hammond assimilation wetland has generated controversy because marsh deterioration occurred during the winter of 2007-2008, immediately following discharge of the effluent. Field observations and exclosure experiments indicated that the deterioration was due to herbivory by nutria (Shaffer et al. 2015). Others proposed that the deterioration was due to excessive inundation and nutrient induced decomposition, however, after nutria controls were put into place the vegetation in the assimilation wetlands began to recover, and it now mostly vegetated. Comite Resources visits this wetland monthly as part of LPDES permit requirements as well as for a marsh organ experiment with Dr. Gary Shaffer of Southeastern Louisiana University measuring the impact of rising sea level on plant growth. 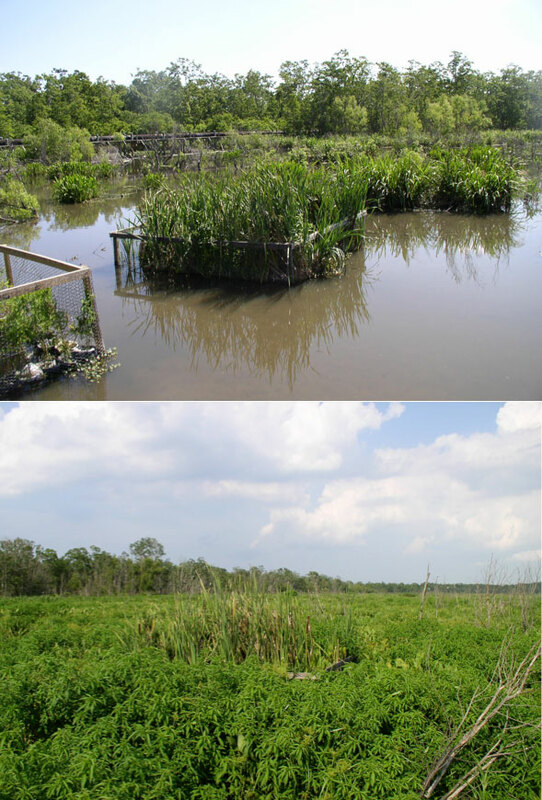 Photo (top) of a fenced 2 x 2 m exclosure at the Hammond assimilation wetlands that prevented nutria entry established in 2008 after intense grazing over the fall and winter of 2007-2008, and another exclosure (bottom) during the Summer of 2011 after substantial recovery of marsh growth. The discharge pipe is located near the tree line in the background in the upper left of both photos. 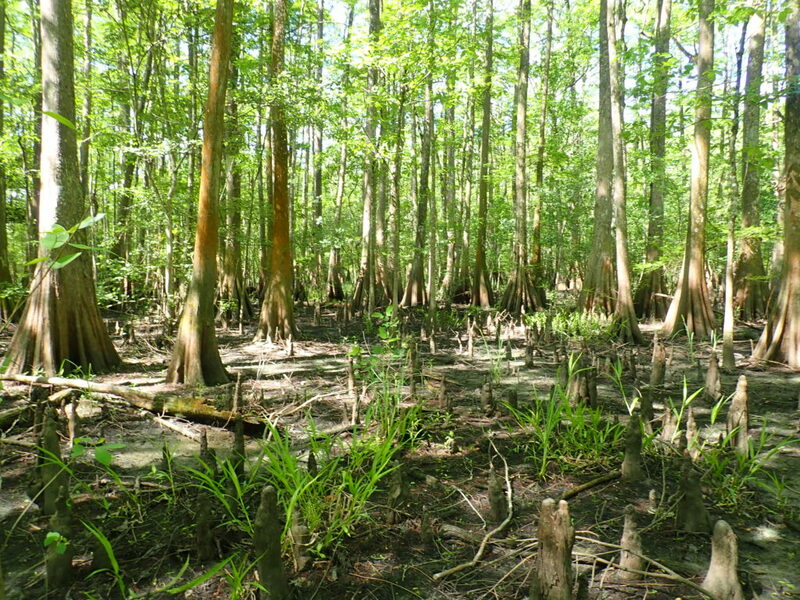 The city of Mandeville began discharging secondarily treated and disinfected municipal effluent into the Bayou Chinchuba assimilation wetland in 1998, but due to high loading rates a second assimilation wetland was established at the Tchefuncte Marsh. Effluent was then split between the two assimilation wetlands, and effluent discharged at this new location began in 2009. The wastewater treatment system includes three aerated lagoon cells, a three-celled rock reed filter, and an ultraviolet disinfection system. 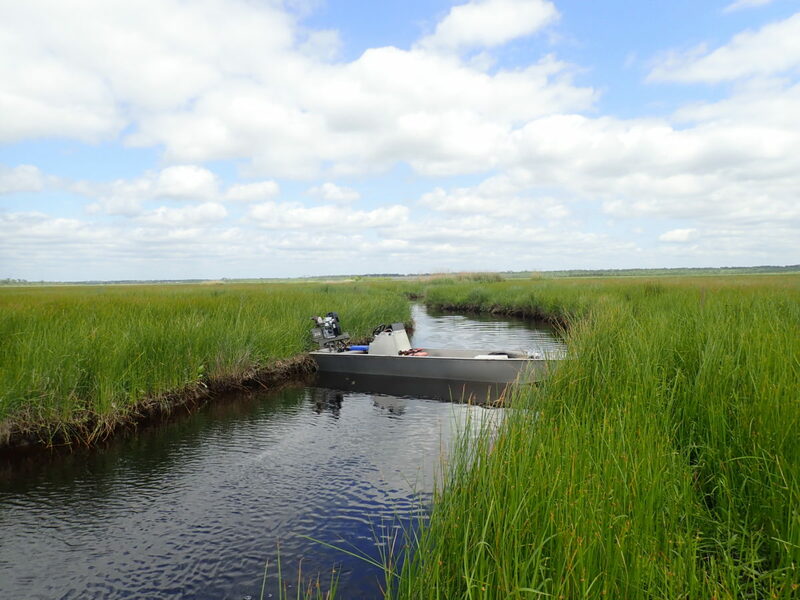 Comite Resources has been monitoring this wetland since 1998 and works closely with wastewater treatment personnel to maintain its rock reed filter and compliance with its LPDES permit.